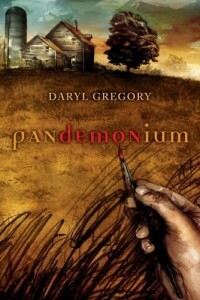 Regardless — on the basis of Pandemonium I started seeking out everything I could find by Daryl Gregory, and I was not disappointed. He’s not just good — he’s good enough that I will now read anything by him, even things I wouldn’t normally read, because I know he’ll deliver. Horror novel? I generally dislike horror, but when I went to a live reading of his at Readercon last year, he read from We Are All Completely Fine, and I instantly pre-ordered it. Zombies? I hate zombies. Raising Stony Mayhall? Snatched it up. There’s something especially engaging about Gregory’s characters. I think that (like Robert Charles Wilson, another favorite of mine), he’s particularly good at giving the reader a strong sense of how remarkable and shattering events effect the real people stuck in the middle of it all, the ground-level experience. And he’s able to make me love his characters — possibly in part because he so clearly loves them himself. His most recent is Afterparty (in which there is a drug that makes you think you see God), but I think that if you’re new to his work, Pandemonium is a good place to start. It’s charming, and eerie, unpredictable and heartbreaking. And I do so love the two brothers, Del and Lew, who seem so perfectly real to me, with such true-to-life adult sibling interaction, the kind that has a wealth of history behind it. Another good place to start is with his short story collection, Unpossible. You’ll get a real sense of his range from that.